« Try Holiday Bonus for free! It’s that time again when I like to review how I got on with my goals for the year and set new goals for next year. Last year I had about a 70% success rate, but this year the success rate wasn’t so good for a variety of reasons that I’ll discuss at the end of this post. So in summary, uh lots of failures. Only a 28% success rate. Really not my best year for a bunch of reasons, although it did start well and has ended well. However things are lining up for a great 2012! – Made 3 mini-games via 48-hour jams (GGJ, Full Indie Jam, Ludum Dare #22) and started another one I aim to finish off at some point. – Shipped 10 different versions of Holiday Bonus to mobile and web during 1 week! – Spoke on a panel at PAX Dev and Casual Connect about being indie + at other local events. – Began work on a great project with Klei Entertainment. – Reached over 150,000 units sold for all my games. – Continued to build the Grey Alien Games name via Twitter, Facebook, Blog, speaking and networking. – Spring Bonus (my 7th casual game) turned out well and has made as much revenue as Holiday Bonus in under a year. – Got Holiday Bonus and Oz on several new portals, shipped Holiday Bonus in 8 new languages, and did the groundwork for shipping localised versions of Oz in early 2012. – Got a Provincial Nomination which means that the Canadian Government thinks I’m “worthy” and should help my family get residency here. – Improved my acoustic guitar playing some more and brought my electric up from the basement so I play it more often. – Looked after my family and the house whilst my wife was ill during the Spring/Summer. – Was around much more for my kids this year. – Deepened my friendships with some great indies. 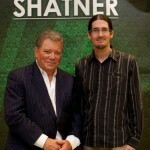 – I got my photo taken with Shatner, and 3 other Star Trek actors! 1) Ship Eets Munchies in the Spring(ish). Working on this as Producer/Designer/Script monkey with Klei Entertainment and Alex Vostrov. 2) Make $250K+ and pay off a large chunk of UK mortgage. 4) Make a new casual game (working as Producer/Designer whilst someone else does the rest using my existing engine). 5) Ship Spring Bonus and Oz on iOS/Android and maybe more platforms. Ideally BFG will publish both because my own mobile marketing success is poor. 6) Make at least 3 jam games. 8 ) Complete secret project in January or February. 1) Do lots of walking and do the Grouse Grind in under an hour. 2) Continue to improve on guitar and post something on Youtube. 3) Do one or more road trips in Canada/US. 4) Have a great relaxing summer with my family. – I didn’t buy my Big Fish Games options when I left, then later in the year they paid out a dividend to everyone who had them. I didn’t buy them because I really needed to money to survive and to invest in Spring Bonus (which has yielded a 10x return so far). – When I was working extremely long hours to finish Spring Bonus on time my wife became really ill. In fact on the day I was supposed to ship it I had stayed up until 9am working on it, slept for only 1 hour, and was just finishing it off when my wife said I had to take her to the hospital urgently. I was sleep-deprived and stressed about the game and then my wife’s health was like the world’s biggest straw on my camel’s back. It was one of the toughest days of my life. We found out my wife was pretty darn ill and she had surgery which failed, and then she had chemotherapy all summer. This meant she couldn’t work, and we ate up our savings at an alarming rate, although a friend was kind enough to help us out a bit financially. Also I couldn’t work much because I had to look after the kids and the house and my wife. The good news is that she has now finished her treatment and has recovered and has been working again; so life has returned to “normal”. This whole thing wasn’t really a “mistake” but it had a major impact on the year and my goals. – After I finished Spring Bonus I felt totally burned out. I wasn’t just burned out from Spring Bonus, but also from working at Big Fish Games for the previous 2 years. Plus my wife’s ill health, our money worries, and uncertainty about where we were going to be living (UK or Canada) all added up to a huge mindfrak. I got depressed, although I didn’t admit it to myself until later on, and did virtually no work all summer. I moped around, played the guitar a lot, and considered giving up working in games altogether. At first I was worried about not doing any work, then I took some St John’s wort pills (a natural anti-depressant), and then I stopped caring about not doing any work and quite enjoyed parts of the summer. But I knew that I couldn’t carry on like that, so I stopped the pills and starting drinking coke, which somehow motivated me to get going on a bunch of projects, and now I’m pretty much fine (and have given up the coke). Strangely it helps that it’s crappy weather outside because I don’t mind working inside all day. It was a very strange time for me, one that I’m not keen to repeat. – I still haven’t sorted through the photos of my dad, who passed away in 2010, and processed his recordings (he was a musician). I still can’t handle listening to his voice or looking at photos of him. I was planning to do that this year and spend a week or so dealing with it all because I figured it would make me pretty emotional, but I’ve had quite a lot of my own stuff to deal with instead. I can feel that I’ve got some stuff locked up in me that I need to let out at some point, and the sooner the better. So there you have it. Life certainly is filled with ups and downs! Here’s to hoping that 2012 has a few more ups. I wish you all the best in 2012. Happy New Year! This entry was posted on Tuesday, December 27th, 2011 at 7:01 am and is filed under Plans. You can follow any responses to this entry through the RSS 2.0 feed. Both comments and pings are currently closed. Very insightful and honest read. Best wishes for 2012. Keep going! And you pushed through it mate, that’s the big thing. You’ve achieved a hell of a lot the last year despite things getting rough around you. 🙂 Fingers crossed that 2012 is the year you get to buy your own Yaht…. “But it ain’t about how hard ya hit. It’s about how hard you can get it and keep moving forward. Thanks for your kind words everyone! I have pushed through various stuff in 2011 and am indeed hoping 2012 will be better in a number of ways. Hope it’s also great for you all! @Haris: I love that quote from the new Rocky movie. In fact I used it in a speech a couple of years ago I gave to students at VFS and also GNWC. Sounds like a busy year! I’d just like to say that I’ve watched a lot of your YouTube videos and read a lot of your blog posts and I’ve found them all very informative. I think it’s helping me to become a better game developer, so thank you for that. I hope you achieve all of your 2012 goals! Hi Andrew, great glad to hear you’ve found my info useful. Faerie Solitaire was a popular game, congrats on that! This summer must have been frightening for you and your family. You must be glad to be living in a country with decent health care. Nice to read that the year is ending well. Just discovered the YouTube videos. You have amazing kids. The speech about your father was hard for me to watch, but very moving. The Grouse Grind sounds brutal. Looking forward to more of your games to be available for my iPod. Hi Rye, thanks for your reply. Yes this summer was difficult but we are glad that there were specialists in Vancouver and decent healthcare for sure. Last year was tough for me too due to the loss of my father and I did that speech to help me come to terms with what happened a bit. Talking about loss seems to help the healing. Hi Jake, Sorry to hear that things were so bad. Glad to hear your wife is better. Here’s to looking forward to a better 2012. I think sucess can be measured in two very different ways: what we do, and who we are. You have covered your feelings about what you did. I wonder how you feel about who you were last year, and the person you are becoming. On a personal note, you were there for us when it mattered most, and that is a success that will most likely outlast the other things you mentioned where your family is concerned. I only just now got around to this item in my RSS feed. Wow, there were a lot of events last year that you hadn’t made known over Twitter and other social media. Congratulations on making it through the year! P.S. From my point of view, your last year (highs and lows) looks pretty impressive and filled with successes I’m still hoping to achieve. Thanks Kyle! Yeah I prefer to keep my social media output positive, it was certainly quite a year. Thanks for the best wishes, same to your family! Yes it’s true there were quite a few successes but I’m aiming for 2012 to be better all round.